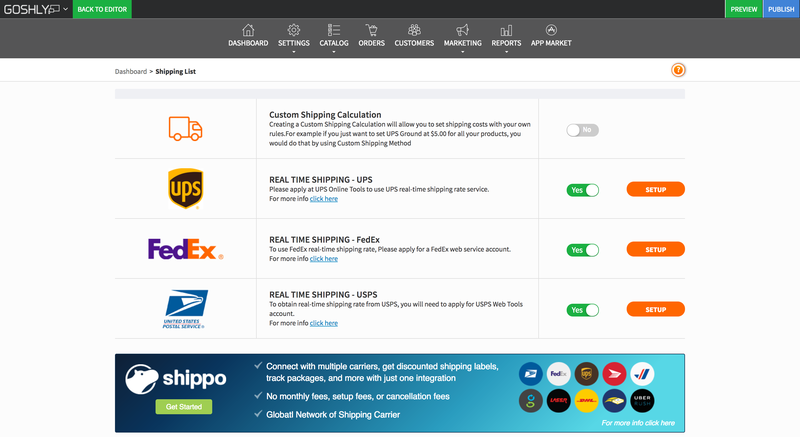 Choose between Custom Shipping Rates (you will create your own shipping rules) and Real-Time Shipping (you will use carrier-defined shipping rules). Choose between fixed cost, by quantity, or by weight to configure your custom shipping method. Active: Toggle Yes to make the custom shipping method active (available to customers). Shipping Name: Enter a shipping name for the custom shipping method. Free shipping & handling for large orders: Toggle Yes to offer free shipping for large orders. Free shipping & handling for orders larger than: Set the minimum order cost for the free shipping option. Shipping cost per customer order: Set the shipping cost for an order. First Item: Enter the cost of shipping for the first item in an order. Next Item: Enter the cost of shipping for each subsequent item after the first item. Go back to Custom Shipping List. Click on Weight Rates for the newly created By Weight shipping method. Enter the To Weight value and shipping rate for the weight bracket. Add as many new weight rules as needed. Click Setup for Custom Shipping Rates. 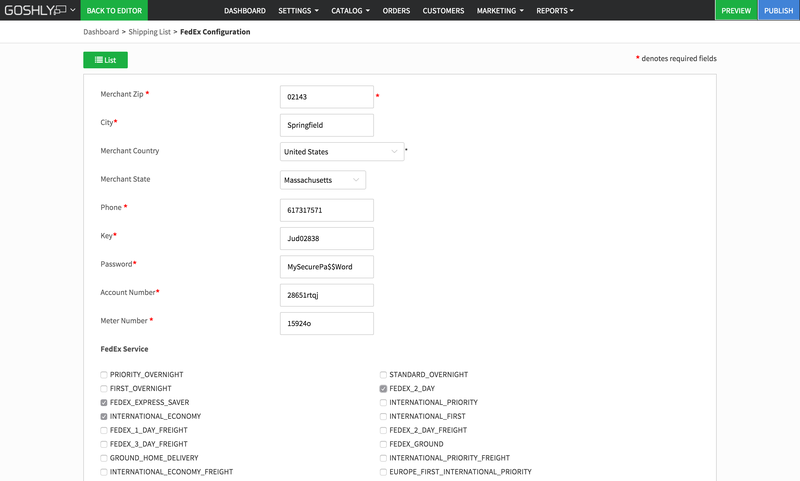 Set Merchant Country: Pick the country you are configuring the custom shipping methods for. Delete: Use the checkboxes and a trash can icon to delete one or multiple custom shipping labels. ID: Displays shipping method IDs. Shipping Name: Displays the names for each custom shipping method. Active: Displays whether a custom shipping label is active or not. 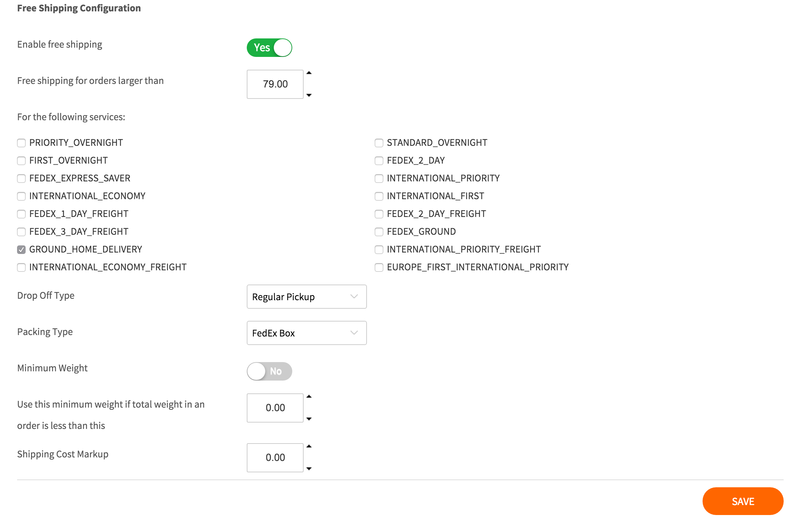 Weight Rates: Option is displayed for By Weight shipping methods and allows to add/edit weight rates. Apply To All Products: Click to apply a custom shipping method to all products. NOTE: Applying to all products will override existing shipping methods. Remove From All Products: Click to remove a shipping method from all products. Edit: Allows to edit settings for the shipping methods. Choose carrier(s) for real-time shipping. 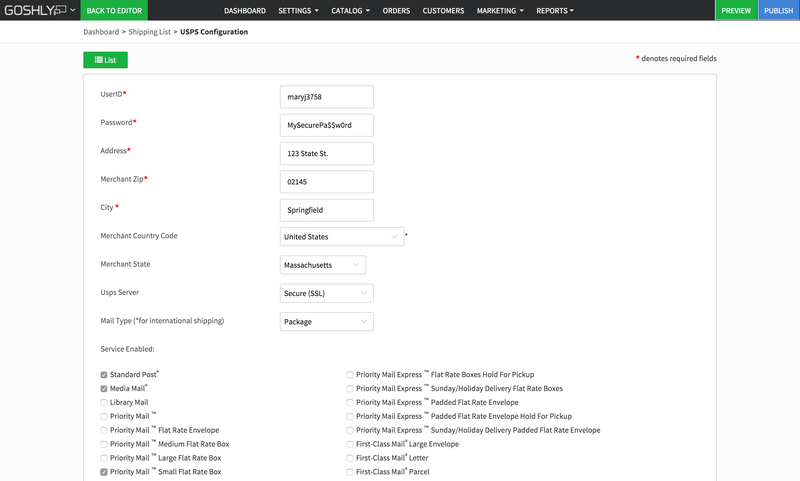 Click Setup for each enabled carrier (UPS, FedEx, USPS) to connect carrier account(s) and choose shipping options. Merchant Zip: Enter merchant's zip code. City: Enter the ships from city. Merchant Country: Choose the ships from country. Merchant State: Select merchant state if United States was selected as Merchant Country. User ID: Enter your UPS user ID. Password: Enter your UPS account password. Access License Number: Enter UPS access license key. If you don't have one yet, you can learn more and request one here. Account Number: Enter your UPS account number. Test Mode: Toggle Yes to test UPS real-time shipping before making it available to customers. UPS Service: Select UPS shipping options you would like to offer to your customers. Enabled free shipping: Toggle Yes to enable a free shipping option. Allow free shipping if order total is greater than: Enter the minimum order amount required for free shipping. For the following services: Choose UPS service(s) for the free shipping option. UPS pickup type: Select a UPS pickup type. UPS Minimum Order Weight: Toggle Yes to enable a minimum order weight. Use minimum order weight if total weight is less than: Set the minimum order weight. Shipping Cost Markup: Set the shipping cost markup. Merchant Country: Select merchant's country. Merchant State: Select merchant's state if United States was picked for Merchant Country. Phone: Enter merchant's phone number. Key: Enter your FedEx key. Password: Enter your FedEx password. Account Number: Enter your FedEx account number. Meter Number: Enter your FedEx meter number. FedEx Service: Select FedEx shipping options you would like to offer to your customers. Enable free shipping: Toggle Yes to enable a free shipping option. Free shipping for orders larger than: Enter the minimum order amount required for free shipping. For the following services: Choose FedEx service(s) for the free shipping option. Drop Off Type: Select a FedEx drop off type. Packing Type: Select a FedEx packing type. Minimum Weight: Toggle Yes to enable a minimum order weight. Use this minimum weight if total weight in an order is less than: Set the minimum order weight. UserID: Enter your USPS user ID. Password: Enter your USPS account password. Merchant Zip: Enter merchant zip code. Merchant Country Code: Select merchant's country. Merchant State: Select merchant state if United States was picked for Merchant Country Code. USPS Server: Choose between non-secure and secure (SSL). Mail Type (for international shipping): Select USPS Mail Type for international shipping option. Service Enabled: Select USPS shipping options you would like to offer to your customers. Use Free Shipping: Toggle Yes to enable a free shipping option. Free shipping if order subtotal is greater than: Enter the minimum order amount required for free shipping. Service Free Shipping Cost: Choose USPS service(s) for the free shipping option. Use minimum weight: Toggle Yes to enable a minimum order weight. Minimum weight per order: Set the minimum order weight. Markup Price: Set the shipping cost markup.